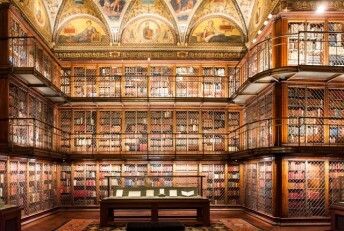 In 1906, the Morgan Library was opened to be serve as home for J.P. Morgan‘s vast private library. Since then the library’s collection has expanded and the institution has also become a museum that boasts copies of drawings made by Michelangelo and Picasso, sheet music handwritten by Mozart, and three Gutenberg Bibles. The museum has always been famous for its exhibitions of unique artifacts, which without fail draw large crowds. This fall, the Morgan Library and Museum is hosting a fascinating exhibition, with an appropriate, macabre Halloween theme. Titled Edgar Allan Poe: Terror of the Soul, the exhibition consists of more than 100 objects related to Poe’s career including one of the first manuscripts of The Bells, and one of the earliest publications of The Raven. The exhibition explores the famed writer’s well known moods and themes, how they developed, and how they influenced those who followed him through his poems, short store manuscripts, letters, and literary criticisms that were published in a variety of newspapers, magazines and journals. 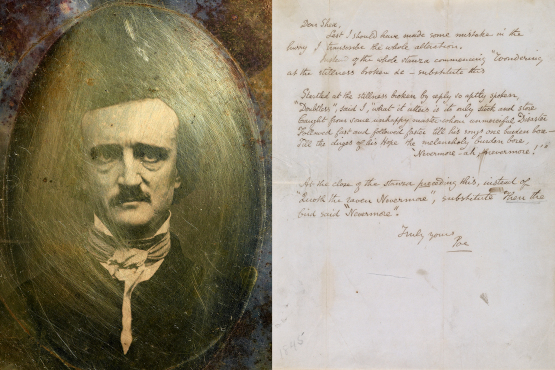 The items on display originate from both the museum’s own collection as well as from the Henry W. and Albert A. Berg Collection of English and American Literature at the New York Public Library, collections that are well known for possessing a valuable Poe materials in the United States. The exhibition will also showcase several private collection loans.